I continue to study permaculture, and swales are very popular within the permaculture community. A swale is a ditch which holds water, instead of moving it from one place to another. 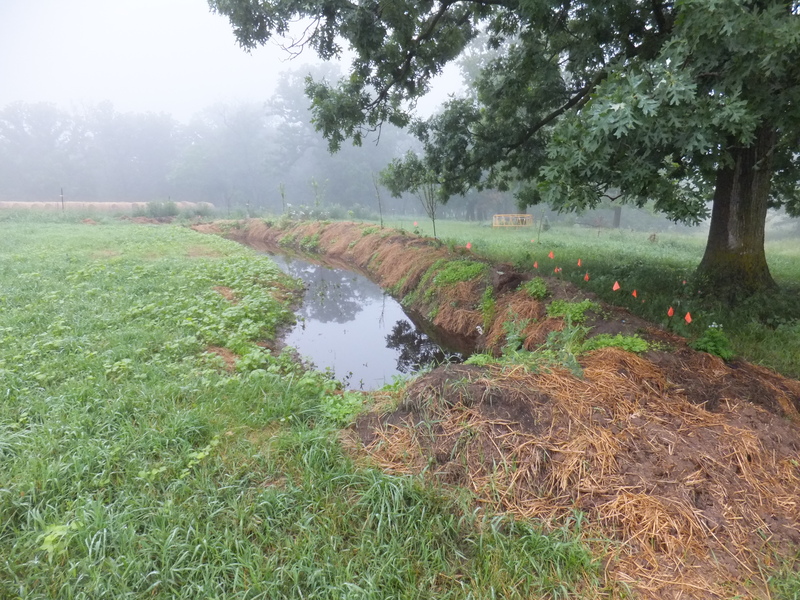 A swale is dug on the contour of the land, and its purpose is to slow the runoff of rain water, so it infiltrates into the surrounding soil instead. The Permaculture Research Institute has an excellent post if you want to learn more. 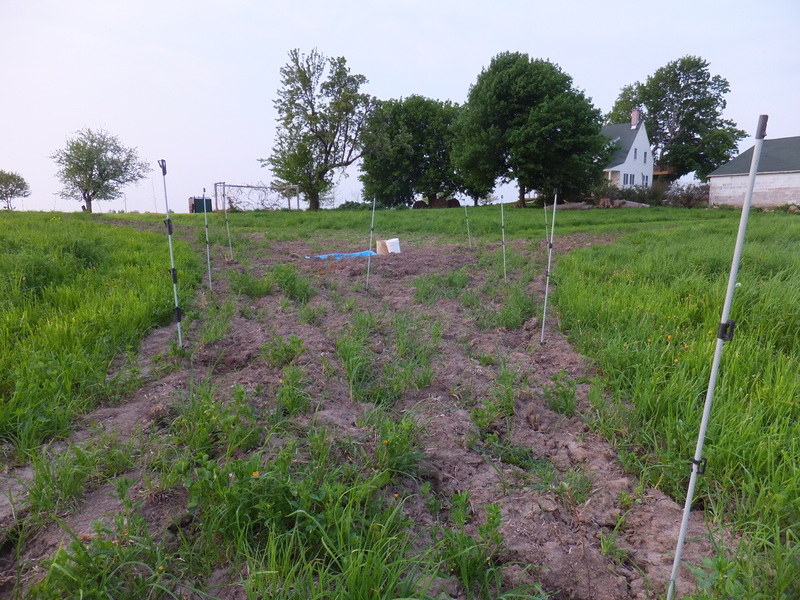 Last year we had a couple of landscaping consultants come to the farm, and while they were here, I asked them to help me lay out the contour where I wanted to plant my permaculture windbreak. They used a builder’s level. I was glad they did, because my eye would have made a lot different contour than what the tool said. This year I knew I wanted to plant my evergreen windbreak on the contour,and I also wanted to make a swale. The consultants charged me enough last year that I knew I wanted to do it myself if at all possible. I needed a level. I looked at some of the plans to make an Aframe level. It seemed doable, but slow to use. I looked on Amazon and started researching levels. 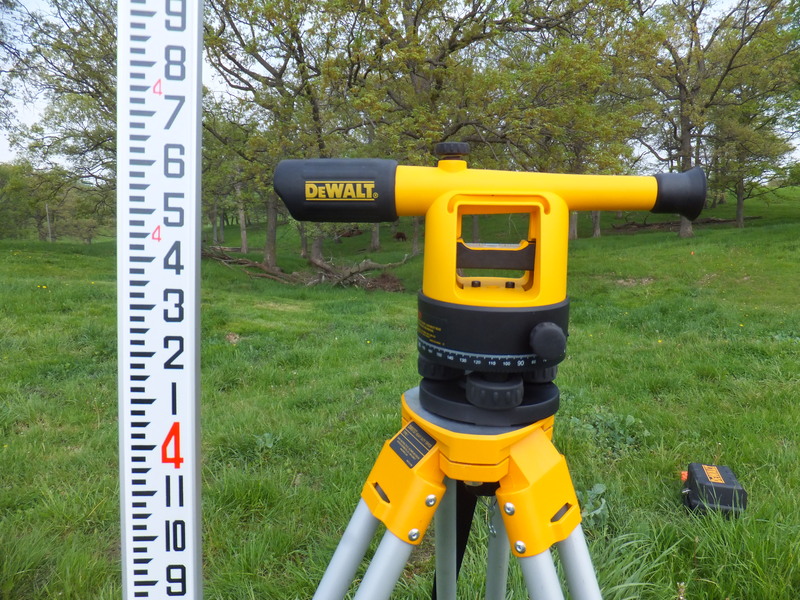 I decided to purchase the Dewalt DW090PK level. I could have spent more and purchased a laser level, which would mean I could do the job by myself. But I thought it would be quality time to lay out contours with my sons. I could have also purchased a transit level, which I guess would have allowed me to do vertical angles. I didn’t have any experience with this stuff, so my understanding may be off. So after much research, I got my level and started practicing with it. It turned out to be a good purchase. I really enjoy using it, and am amazed at how far off my eye is. Below is my first swale. After flagging out the contour with my level, I built it with my loader. It’s about 100 feet long. Five plum trees and six currant and jostaberry bushes are planted along the ridge. I mulched with hay to keep the sides from eroding. It got dry after I made the swale and I wanted to see how much water it would hold, so I filled my Dad’s liquid manure spreader with water and put it in the swale. It can safely hold over 1000 gallons of water. We have also had rains of over two inches and it had no problems taking that amount of rainfall. No matter how wet we have been, almost all the water has soaked in after 24 hours. And all of it has soaked in after 48 hours. I haven’t had to water the plantings, and we’ve gotten pretty dry in August, so it appears that the concept is working. I’m not sure how practical swales are. I like the concept, as I hate to think of rain water running off the land. I think they work best for smaller-scale agriculture. As I plant more trees, I think it would be wise to plant them on swale mounds as this will help with their watering needs. A permaculture guild is a strategic design of organisms benefitting the whole. Like all the best concepts of permaculture, this mimics the way nature designs. The photo above shows an abandoned fenceline along Oak Grove Lane. 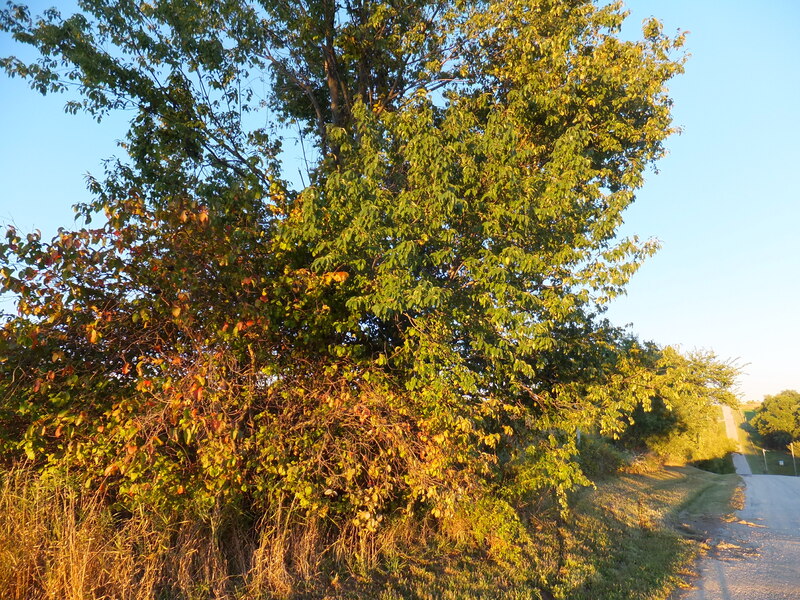 I started thinking about this fenceline when I noticed the Nannyberry bush, which is in the left of the photo with yellow, red, and green leaves. It’s a little bit humbling, but I realized if I’m successful with my edible windbreak planting, in fifteen years it will look like this abandoned fenceline. It’s also reassuring to know I’m mimicking nature, which uses space so wisely. The amount of solar energy turned into food and fodder for everything from microorganisms to birds to humans is amazing. Just in this photo there is the Nannyberry bush, growing under a Chokecherry tree, which has Wild Grapes hanging from its limbs. Grasses and forbs cover the ground. The rest of the life in this area would take a lifetime to catalog. 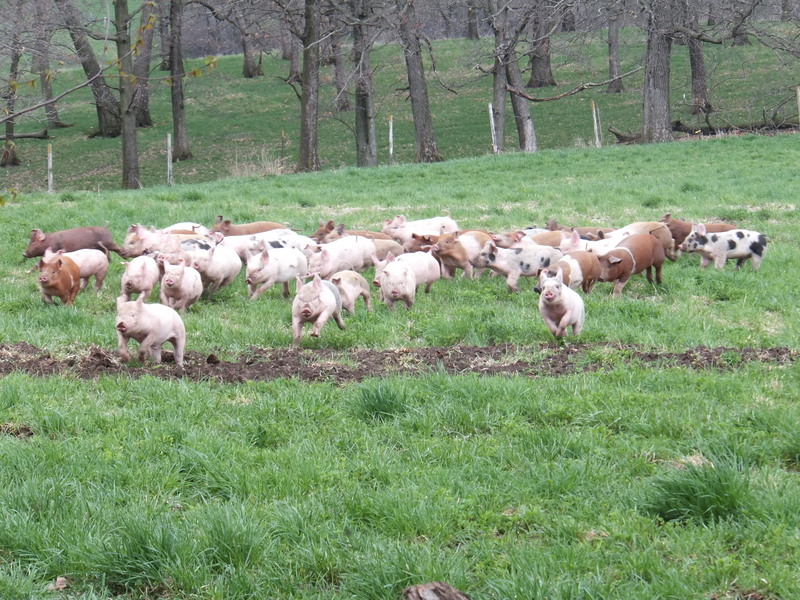 Piglets running across my Permaculture planting. They dug up three Hazlenut before weaning. I purchased a Jostaberry and a Blackberry from Jung’s to replace them. All of my Permaculture reading this winter led me to want to play myself. I’ve always wanted a windbreak north and west of my house, but I don’t like conifers. So I designed what will hopefully grow into an edible windbreak. In a short-bottomed Y, placed on the contour of the land, I chisel-plowed this spring, then planted the trees and shrubs I purchased from our county, Jung’s, and Chief River Nursery as they arrived. I also dug a hole and placed a kiddie pool to collect rainwater for bucket irrigation when it turns dry this summer. Below is a Juneberry. I also planted Hazlenut, Highbush Cranberry, Jostaberry, and Blackberry bushes. The trees I planted are Apple, Plum, Peach, Apricot, and Hackberry. If this planting goes well, I have an idea to continue the bottom of the Y with the contour of the land and continue to farm each side of it. 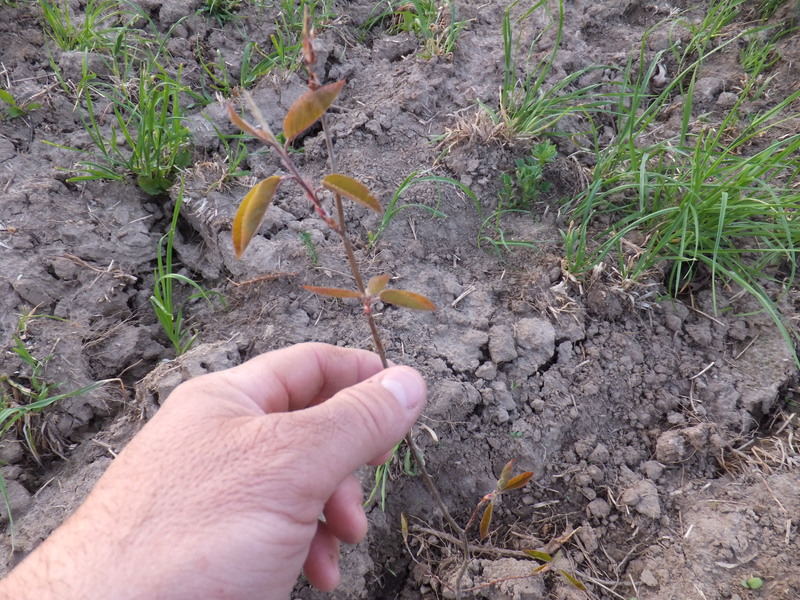 It’s been said the best time to plant a tree is ten years ago, and the second best time is today. The planting certainly doesn’t look like much today, but I hope I’m still blogging in ten years and can show you what it looks like then. You are currently browsing the archives for the Curious permaculture category.